When I was a student at Brown University, one of my favorite Providence landmarks became Prospect Terrace Park. I'd go there to destress after a challenging exam, at the end of a long run, and even to set up a picnic on a date or two. I loved being able to look out over the diversity of Providence: the lit up State House at night, the booming downtown, the construction in the distance. 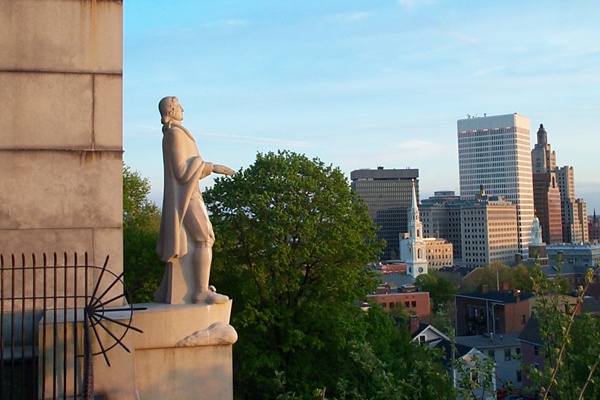 When I was feeling extra adventurous, I'd climb over the gate, and slide down into a nook to overlook the city with Roger Williams, whose statue protects the city. I would ponder all of the existential questions that college students (especially Brown students) think upon, and feel at peace. After a few outings to the Park, I decided to do research to learn more about this this mythical Roger Williams figure. I realized that he was a political pioneer whose legacy lives far beyond his time, or his state. Simply put, through his defense of religious freedom, espousing abolition as a cause in the age of slavery, and advocating for the rights of Native Americans, he went against the grain. He was not afraid to espouse unpopular beliefs, and defend the rights and freedom of his fellow citizens. He helped to found Rhode Island, but his impact was felt throughout all of the colonies. During my senior year at Brown, in 2009, I co-founded an organization called Generation Citizen (GC). GC's mission is to empower young people to become engaged and active citizens through implementing action civics in secondary schools. Students learn politics through engaging in local politics,taking action on real issues that affect their lives: public transit because RIPTA passes are too expensive, police-community relations because they feel unsafe, snow-plow removal policies because their streets are not cleaned fast enough during the winter. In a sense, implicitly and explicitly, we want all of our students to think like Roger Williams: passionate in their convictions, and unafraid to go against the grain to advocate for issues they care about. Since GC was founded in 2009, it has become a national organization, with offices in Boston, New York City, San Francisco, Austin, and Oklahoma City. Proudly, we still have an office, with three employees, in Rhode Island. Much like Roger Williams' ideas of separation of church and state and abolition started in little Rhody, and expanded to the rest of the country, so does Generation Citizen. I visit all of our sites on a regular basis, but nothing makes me prouder than going into a classroom at Central High School, or, our biggest middle school partner, Roger Williams, and seeing students passionately convince decision-makers to take action on issues that they care about. I no longer live in Providence, but frequently come back to see our program in action. On many of those trips, I stop back in Prospect Terrace Park. I stop in front of the statue, too nervous to jump the fence as I get older. I reminisce about my college years, and clear my mind after a hectic work day. And I look over Providence, with a view similar to Roger Williams, renewed again in my idealism to help push for the issues I care about. Roger Williams lives on in Rhode Island. And so does his relentless pursuit for a more equitable democracy, through the action of students throughout the Ocean State. Scott is the Chief Executive Officer of Generation Citizen. He co-founded the organization at Brown University with fellow student Anna Ninan during their senior year in 2009, and has worked the last seven years to build up GC’s programming and work to expand action civics throughout the country.